Shamlat Deh—Repartition of—Director Land Records is obligated to determine whether the subject land could be partitioned amongst the proprietors and if so, whether the previous orders partitioning the subject land were valid and passed in accordance with law. Comments Off on Shamlat Deh—Repartition of—Director Land Records is obligated to determine whether the subject land could be partitioned amongst the proprietors and if so, whether the previous orders partitioning the subject land were valid and passed in accordance with law. Village Common Lands —Shamlat Deh—Not every land which is recorded as owned by thola can be shamlat deh. Comments Off on Village Common Lands —Shamlat Deh—Not every land which is recorded as owned by thola can be shamlat deh. The revenue record does not depict that the land was partitioned amongst the proprietors before the year 1950 or they are in its cultivating possession as per their respective shares-It necessarily means that the subject-land being ‘Banjar Kadim’ stands included in the definition of “shamlat deh” under Section 2(g)(5) of the 1961 Act. Comments Off on The revenue record does not depict that the land was partitioned amongst the proprietors before the year 1950 or they are in its cultivating possession as per their respective shares-It necessarily means that the subject-land being ‘Banjar Kadim’ stands included in the definition of “shamlat deh” under Section 2(g)(5) of the 1961 Act. Village Common Lands—Utilization of Shamlat Land—Where the area to be utilized for common purpose is less than 100 acres neither the approval of the Panchayat Samiti, nor the approval of the appropriate Government is required to be obtained. Comments Off on Village Common Lands—Utilization of Shamlat Land—Where the area to be utilized for common purpose is less than 100 acres neither the approval of the Panchayat Samiti, nor the approval of the appropriate Government is required to be obtained. Village Common Lands—Eviction—Encroachment—In respect of ‘shamlat den’ lands procedure contained in the 1961 Act, is to be followed; In the case of ‘Jumla Malkan’ lands, the provision of, 1976 Act applies; and In case of encroachments of the gram panchayat lands for eviction to be initiated in accordance with the provisions of the 1976 Act read with the 1973 Act. 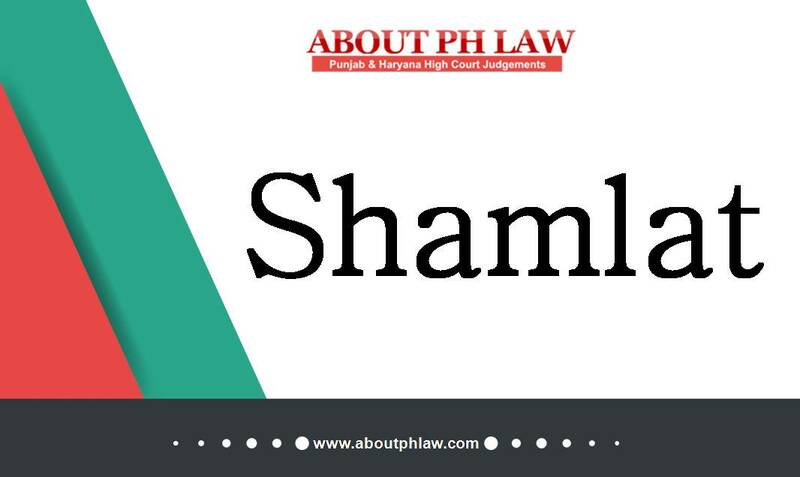 Comments Off on Village Common Lands—Eviction—Encroachment—In respect of ‘shamlat den’ lands procedure contained in the 1961 Act, is to be followed; In the case of ‘Jumla Malkan’ lands, the provision of, 1976 Act applies; and In case of encroachments of the gram panchayat lands for eviction to be initiated in accordance with the provisions of the 1976 Act read with the 1973 Act. Village Common Lands—Unauthorized Occupation—Any villager can approach the Collector to protect the interest of ‘shamlat’ land vested in the Gram Panchayat. Comments Off on Village Common Lands—Unauthorized Occupation—Any villager can approach the Collector to protect the interest of ‘shamlat’ land vested in the Gram Panchayat. Village Common Lands—If a land is exclusively used as abadi deh, then it does not include in shamilat deh and no eviction petition under Section 7 in respect of such land is maintainable. Comments Off on Village Common Lands—If a land is exclusively used as abadi deh, then it does not include in shamilat deh and no eviction petition under Section 7 in respect of such land is maintainable.